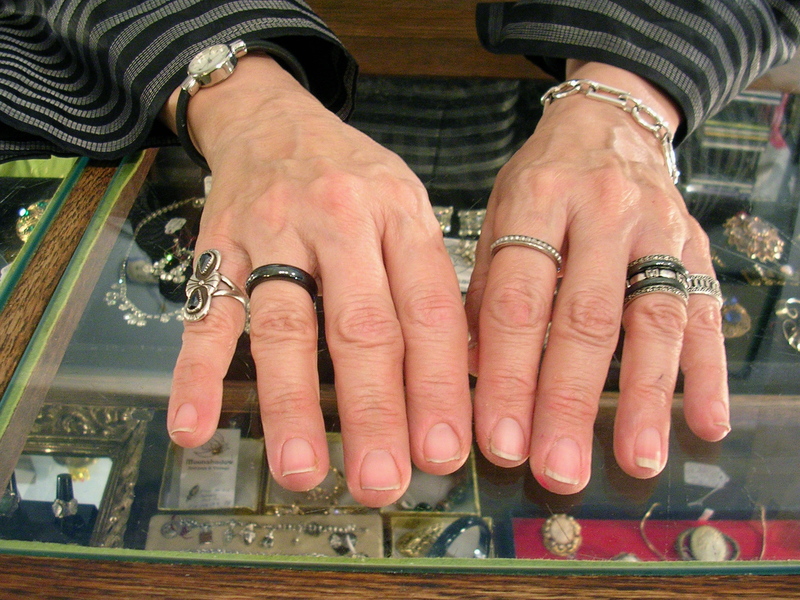 My friend Karen’s hands, Moonshadow Antiques, 2011. FILL IN THE BLANK: My hands are …. Posted on January 15, 2012, in Uncategorized and tagged fill-in-the-blank, hands, Paulette Beete. Bookmark the permalink. 3 Comments. My hands are under attack! Within the last three weeks, I’ve severely jammed by right ring finger, had a dog’s tooth 1/3 of the way into my right index finger, cut the top of my left thumb, twisted the dorsal side of my left hand, and burnt the knuckle of my right hand. Funny, I was pondering this just before I saw your blog…. My hands look wise! I was just looking at the them last night and always imagine them as relatively gnarled. But I’ve decided that since I look so young, my wisdom is not evident in my face, but in my hands. Want me in your e-mailbox?